This tool was designed to edit and print a cheque. Debit Account Number Select the relevant debit account number by using the search wizard. Debit account name The name of the required account. This field will be automatically filled with the name of the selected "Debit Account Number". Payable to Payee Choose whether to mark the cheque as "Payable to Payee Only". Credit Account Number / Name The default Credit account number is taken from the "Bookkeeping" tab of the System Fundamentals ("Payment Cheque Default Account" field). Cheque ID Number Fill in the number of the cheque. The system will not allow to fill in the same cheque number twice. Cheque A4 Format Select the required printing direction, according to the local language. Extended Note Optional field - select the required extended note to print on the cheque. The fields at the bottom of the table will be automatically filled according to the values of the table. Reference Description A short description that will be printed on the cheque. Total The total amount for the cheque. please note - The system will subtract the value of "% Deduction of Tax at Source" from the total amount. select the required currency for the cheque. For foreign currencies, the system will ask the user to choose the date of currency rate. Exchange Rate According to the selected date of currency rate, the exchange rate will be displayed in this field. By Journal Entry Use this button to display all of the not bundled entries from the account journal of this beneficiary. Select entries to add these payments to the cheque and click the Back button. Sum Journal Balance This button is used for calculating the balance of the beneficiary. 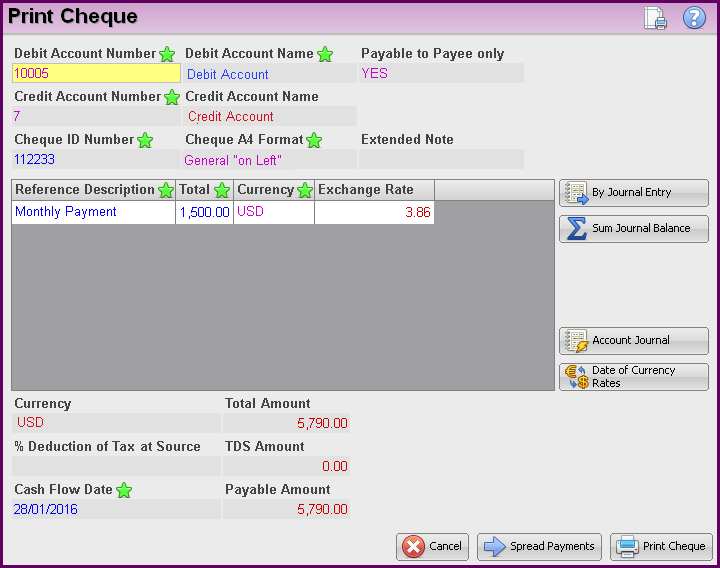 The balance will be automatically filled in the "Total" field. The reference description will be modified to "Account Balance". Account Journal This button opens the Account Journal of the beneficiary. Date of Currency Rates Select the required date of currency rates. As default, the system takes the rates of the current day. Cancel cancel the cheque and close this window. This button is used to spread the payment. 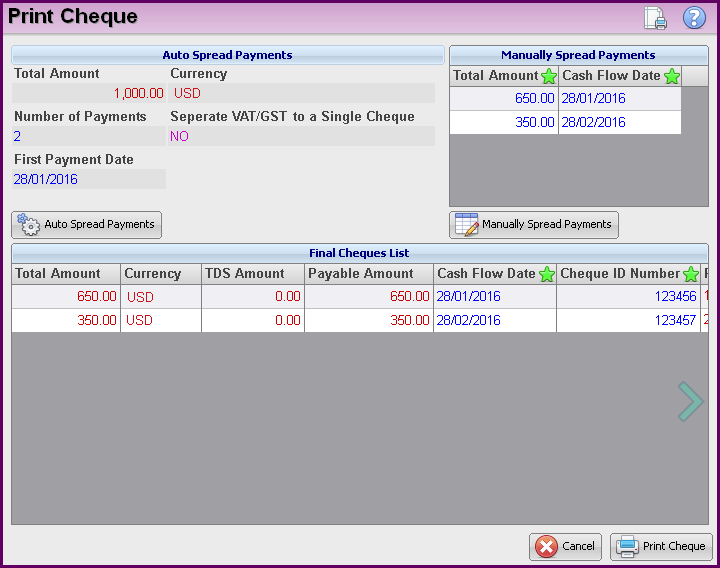 The user can choose whether to Auto Spread the Payments or Manually Spread the payments. Choose whether to Auto Spread the Payments or Manually Spread the payments, fill in the required fields and click the Auto Spread payments or the Manually Spread payments button. In the final Cheques List, the required payments will be displayed, as well as the Cash Flow Date and the Cheque ID Number. These details can be modified by the user. Print Cheque Print the cheque. A preview will be displayed before printing the cheque. Print Certified Copy This button is available only when loading a printed check record. A "certified copy" statement will be added to the cheque. A preview will be displayed before printing the cheque.